Bjork and mother whales. | Pulp and Circumstance, Juiced. If you haven’t already, what are you waiting for? O.K., so humble blogger will break it down. In April 2009, Stereogum asked both the Dirty Projectors and Bjork if they’d be willing to play a benefit in a NYC bookstore. Both said yes. Instead of just winging it, Bjork and D.P. got together and wrote a set of tunes they could play together for the benefit. Enter Mt. 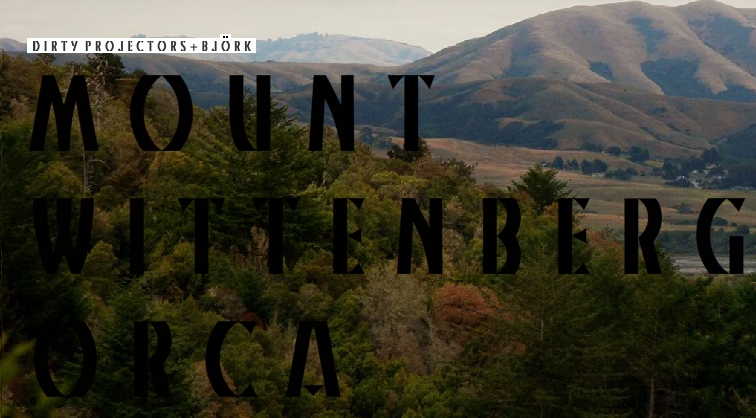 Wittenberg Orca–a brainchild of Amber from Dirty Projectors after she spied some whales along the coast in California. Bjork, of course, agreed to “play the part of the mother whale”. I’m not joking. The rest of the ladies from Dirty played the whale’s offspring. The tracks were played at Brooklyn’s Rare Book Room last year, and they hastily recorded up the tracks with minimal overdub. Now, they are giving away the collection with all proceeds to charity. So pick a donation, gobble tunes galore, support good cause, swoon over the fact Bjork mimicks a “mother whale”. This entry was posted in jwolf and tagged bjork, dirty projectors. Bookmark the permalink. ← Undiscovered ’til Now: …but Chris Chu is involved!